Apple removed more than 1,000 Molinker-made apps from its app store after complaints. (Wired) -- Apple has sent a clear message to any developers who try to game its iTunes App Store. 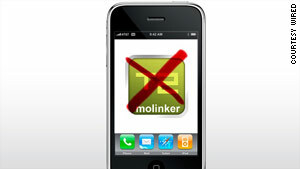 Software developer Molinker has been kicked out, along with more than 1,000 of its iPhone applications. The Chinese developer had, according to some estimates, 1,000-plus applications in the store, most of which were copycat knockoffs of existing applications. When a friend of writers at the iPhoneography photography blog saw these rather poor applications consistently scoring 5-star reviews, they got suspicious. Some investigation showed that Molinker's applications were getting many top ratings and almost nothing in the 2-to-4-star range. In fact, the only other ratings were often 1-star, and likely the only truthful feedback on the apps' pages. iPhoneography wrote a long letter to Apple's marketing boss, Phil Schiller, and posited that Molinker was giving out promotional codes -- essentially free copies of the applications -- in return for these 5-star reviews. In almost all cases, these reviews were poorly written, and came from customers who almost exclusively reviewed just Molinker applications. So what, you say? Some dodgy developer got its entire portfolio chucked down the memory hole, and the App Store continues as if Molinker had never existed. First, the scale of this purging is huge: 1,000 applications represents almost 1 percent of the entire App Store offering. This alone shows that Apple is happy to do whatever it takes to keep its house clean. It also shows the power that Apple has over those that sell in its exclusive marketplace. Sure, Molinker was caught cheating, and punished, but Apple could pull the same trick on any developer, for any reason. We don't think that it would, butiPhone developers are a nervous bunch as it is, rubbing on rabbits' feet and crossing their fingers as their creations make their way through a fickle and seemingly arbitrary approval process. And what about the customers? We doubt that Molinker will be refunding all the money it has made selling the applications (plus 30 percent on top that went to Apple, and is non-returnable). This means that, at best, these customers can keep using their now-banned apps until a future OS update breaks them. Perhaps, though, they should have bought better applications in the first place? This is the key. Because there is no clear way to try-before-you buy, the shareware model that works so well for computers, the ratings are absurdly important to choosing an application. Molinker's scam, then, is almost a symptom of the App Store setup itself. Can Apple actually be blamed for the rise of the ratings scamsters?